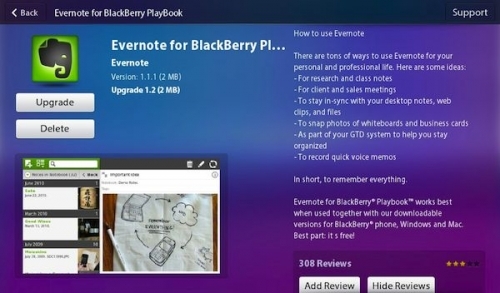 Evernote for BlackBerry PlayBook updated | BlackBerry Blast! Do you use Evernote? I can't live without it these days. Evernote for the BlackBerry PlayBook has been updated to version 1.2, and is now available in the BlackBerry App World. The weird thing is that Evernote has not updated the change log, so we have no idea what has been updated. Maybe it's just a bug fix version, but you'll probably want the latest version no matter what the change is. Check it out at the link below.